QUEEN CITY WOMEN RULE THE POWER LUNCH | South Charlotte Newcomers! The holidays are over and it is time to get caught up with friends! The quintessential girlfriend lunch is a wonderful tradition upheld daily in the Queen City. On any given day in Charlotte, you can witness the girlfriend lunch being enjoyed by lovely Charlotteans. The girlfriend lunch takes many forms and Charlotte’s fine repertoire of restaurants can accommodate them all! The business-woman-girlfriend-lunch is best commenced in a quiet atmosphere. Lulu’s on Central Avenue is just the place for business appointments. The atmosphere in the 20’s style bungalow house in the trendy Plaza Midwood area, on the border of Uptown, is soft and charming. The menu features decadent Pommes Frites (hand cut every day) and the Croque Madame Sandwich, to the more delicate Salad Composée. Business deals will be graciously contracted and deliciously pursued at Lulu’s. If girlfriends and business lead you to South Charlotte, the Gallery Restaurant at the Ballantyne Hotel and Lodge has an upscale, quiet atmosphere to engage in negotiations or just happy chit chat! The menu features a delicious roasted cauliflower soup that can be quietly sipped while contemplating a presentation and a “Express Lunch” tapas style meal that includes a truly picture-perfect plate of a bite-sized sandwich, side dish, a small cup of soup and cute little dessert. Wooing a business partner or catching up with friends can also be effectively conducted over a shared Grilled Artichoke Appetizer, followed by the light, but amazing Crab Cake Salad at 131 Main in South Charlotte at Blakeney, or one of the fabulous Mediterranean dishes at Ilios Noches at the intersection Providence and Ardrey Kell. Business women in the Southpark area will appreciate the calm atmosphere and individualized attention at Cafe Monte, a great Southpark area French bistro tucked in the upscale Phillips Place boutique area near the corner of Sharon and Fairview Roads. 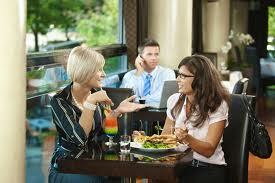 The BFF-girlfriend-lunch requires a fun, buzzing atmosphere to allow for gut giggles and relaxation. BFF lunches do not usually include calorie counting or “just water to drink”. The Mimosa Grill on Tryon Street is a great gathering place for the BFF friends. Try the low-country shrimp and grits, and, of course, a mimosa! Blackthorne Restaurant on North Community House Road in South Charlotte is also a suitable BFF lunch destination. The Duck Confit French Dip with one Bubbly Pear Martini is a delicious indulgence with best friends. Brixx restaurant in Blakeney off Rea Road has a fun atmosphere with a very dainty Gorgonzola Pear Pizza that seems girly, but packs a punch to your palate. City Tavern at Stonecrest, in Ballantyne offers a lively atmosphere and extensive menu: try sharing the City Sampler with your BFF. Book Club gal pals need a large table, lots of room for the kindles and books, and a relaxed atmosphere. The Terrace Café In Ballantyne Village is a South Side favorite and a great book club meeting sight. Firebirds, located at Stonecrest in Ballantyne has a cheerful atmosphere and large booths and tables for all your book club friends. All the pleasantries and serious intellectual conversations are in need of bright lighting with a cheery atmosphere! Amélies French Bakery and Café in the popular art district of North Davidson (NoDa) also has a well-lit, eclectic, Parisian, shabby-chic atmosphere perfect for you and your book club gal pals to sink into a comfy couch and enjoy your book critiques. Try the tomato fennel soup and a croquet-en bouche (think lots of cream and caramel) for dessert from the endless options on the bakery menu. Charlotte is a city of women working and supporting each other professionally and personally. Take a girlfriend lunch and appreciate girl power in the Queen City!